Four Class 387/1s have so far completed their mileage accumulation and have been accepted by Govia Thameslink Railway. Currently 387105-387108 are at Brighton Lovers Walk, having completed testing. 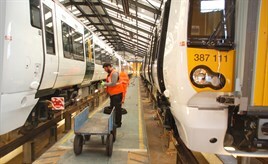 It is planned to deliver one Class 387 to Brighton each week. They will be based at Lovers Walk depot until they leave GTR. Each Class 387 must complete 1,500 miles without a defect. There are 29 on order. For more information, see RAIL 763, published on December 10.